Breathing new life into old structures, especially in an urban area, almost always comes off as a welcome sight. Not only are you being sustainable, but in most cases you're preserving a piece of history from days gone by. 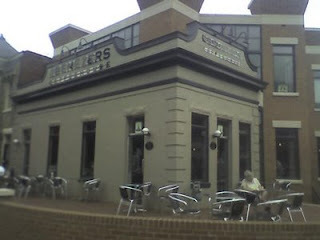 Tis one of the things that I had heard about of a coffeehouse called Ebenezers located right near Union Station in DC. The building had prior been a diner for early AM passengers but in years since had fallen into neglect. Then recently, a local church bought it and renovated it into a coffeehouse and meeting space. Standing outside it on a sunny day, Ebenezers stands out as a gorgeous stone corner property complimented by a beautifully bustling patio. The interior also stands out as a nice work of interior design with warm colors, some nice furniture, and a large amount of free space for traffic. The coffee comes from a Fair Trade-centered roaster called Larry's Beans. The Mocha Java wasn't half bad; a bright honey flavor though it had bit of underlying char. The espresso was a sad story, as not only does Ebenezers not have any ceramic cups (important for espresso) but they also operate an automatic espresso machine (where's the love?). The espresso hence had some nice acidity but little other character. The tea was Mighty Leaf. While I really like what Ebenezers has done with the place, I would say they still have some renovation to do on their coffee practices. If you happen to be near Union Station and in need of a place to meet people or to grab some coffee, give Ebenezer's a heave-ho.